Slurp – the great vampire squid strikes again! That now-infamous description of Goldman Sachs (in Rolling Stone magazine) is a tad hysterical. But it takes some sucking power to extract $3.4bn of quarterly net income within a year of a full-throated banking crisis. With Goldman’s shares close to levels before Lehman Brothers collapsed, you’d be forgiven for wondering if 2008 ever happened. Do not be deceived. 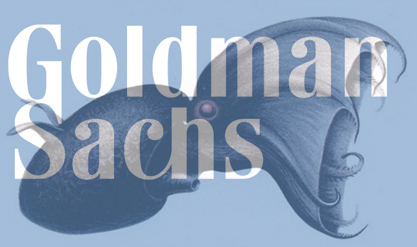 Beneath Goldman’s gleaming mantle is a cephalopod swimming with one powerful arm. Trading in fixed income, currency and commodities generated half the bank’s record net revenues, almost tripling from last year’s second quarter. This client-driven trading is part of Goldman’s DNA but cannot last. Trading margins remained at the historically wide levels of the first quarter (helped by competitors’ demise), while a broad-based recovery in markets induced clients to resume trading. Meanwhile, another stand-out area – underwriting equity and debt sales within the investment bank – owed much to capital raisings by beleaguered peers. The government could yet opt to cut this sucker down to size. Calamari anyone? GS (NYSE: GS) is up 4% due to this squid comp, so I think the market is poo-pooing any notion that the public will be dining on GS calamari. Or any other kind of calamari for that matter. Recommendation: Goldman Sachs’ employees are genetically designed to make money from even the worst situations — the coming Fall of Man should be no exception. When everyone else’s books are well underwater, GS will be floating safe on piles of money. Long GS. Or to put it in other words, the squid and their mortal enemies, the octupi, have made peace and are now wreaking havoc on us whitefish. I’m glad I followed your recommendation and went long Cephalopods, inspired call. Keep up the good work team! Long time shareholder, and believer in future cephalopod long term plans. The real invasion has started…Yes, long cephalopods, especially if they have rightly aligned with GS for a two pronged attack. the signs are piling up!